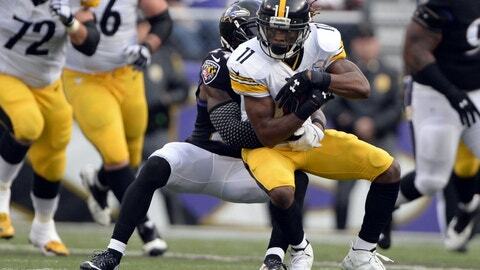 Pittsburgh Steelers: What Is Markus Wheaton’s Future? The Pittsburgh Steelers have their entire wide receiving corps under contract for the 2017 season—with the exception of Markus Wheaton. For roughly a decade, the Pittsburgh Steelers have done an excellent job of drafting and developing big-play wide receivers. From Super Bowl XLIII MVP Santonio Holmes, Emmanuel Sanders and Mike Wallace to Antonio Brown, Martavis Bryant and Sammie Coates. It’s also worth noting that only Holmes was a first-round pick. These days, Brown, Coates and Bryant are the headliners on the depth chart. Then again, the last name on that list hasn’t done much in quite some time. Bryant was suspended for the entire 2016 NFL season due to another violation of the league substance-abuse policy. But according to ESPN’s Jeremy Fowler, the electrifying talent applied for reinstatement in late January. This past season, Brown reached 100-plus receptions for the fourth consecutive year. He was complimented by undrafted free agent Eli Rogers (48 catches for 594 yards and 3 touchdowns), Coates (21-435-2) and Cobi Hamilton. Late in the year, 2016 seventh-round pick Demarcus Ayers made his presence felt. The Steelers still have Darrius Heyward-Bey on the roster as well. So the real question here concerns four-year wide receiver Markus Wheaton? Is he still in the future plans of Mike Tomlin’s club? Does his future depend on Bryant’s reinstatement? Quarterback Ben Roethlisberger enjoyed another big year, throwing for 3,819 yards and 29 scores compared to only 13 interceptions. Wheaton played in only three games in 2016, catching four passes for 51 yards and one score. Fowler also reported that the former Oregon State product underwent surgery in early January to repair a torn labrum. The Pittsburgh Steelers are never seemingly short of pass-catchers. Including running backs and tight ends, 12 different players caught at least one touchdown pass in 2016. That includes Wheaton, who now faces a very uncertain future in the Steel City. But this is also a franchise that exercises a lot of patience. So don’t look for an immediate answer to the question until Bryant’s situation is resolved and Wheaton is healthy—which is why this is one of the more consistent and efficient franchises in the league.